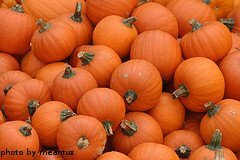 Need Information About Harvesting Pumpkins? You've come to the right place. When harvesting pumpkins, there are several little things you should do that will make the fruit last longer and taste better after picking. Pumpkins should be harvested before the first frost to avoid damaging the fruit. 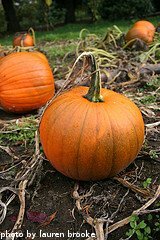 When pumpkins appear on the vine, it's a good idea to slip a piece of cardboard or plastic mat underneath the fruit itself. By preventing the pumpkins from directly contacting the soil, you will greatly reduce the chances of it rotting on the ground. Some people remove any foliage covering the pumpkin the last few weeks before harvesting. It is believed that the pumpkins will ripen better in full sun. By the end of the growing season, pumpkin plants will look tattered and beaten down. It's time to think about harvesting pumpkins when they have rich, deep colors and when the stems begin to dry up and shrivel. The skin on the pumpkin should be hard. To harvest pumpkins, use a knife or shears and cut the stem 2 inches or so above the fruit. It's best to leave a couple of inches of stem to help the pumpkins stay fresh longer. After cutting the stem, lift from the bottom to remove the pumpkin. Never lift a pumpkin by its stem, as the stem may break off and cause the pumpkin to perish much more quickly. After picking the pumpkins, you should cure them. The curing process will extend the storage life of the pumpkins. It will also enhance their taste and texture. Place them in a dry, sunny location for 10-14 days. If frosty nights are expected, cover the pumpkins with a sheet or blanket at night. After curing your pumpkins, they can be stored for several months. A root cellar is the best place to store pumpkins. However, since that is usually not available, a cool, fairly dry place will work just as well. Temperatures in the 50-55 degrees F range are ideal. Basements or crawl spaces are appropriate storage locations. The pumpkins are ready to use anytime after curing. They can be carved for Halloween, used in fall decoration or in a wide variety of recipes. Now that you're done harvesting pumpkins, you should be ready for a few recipe ideas.